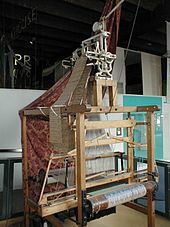 The Jacquard loom, on display at the Museum of Science and Industry in Manchester, England, was one of the first programmable devices. The first use of the word “computer” was recorded in 1613, referring to a person who carried out calculations, or computations, and the word continued with the same meaning until the middle of the 20th century. From the end of the 19th century the word began to take on its more familiar meaning, a machine that carries out computations. 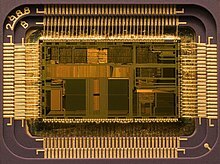 The history of the modern computer begins with two separate technologies, automated calculation and programmability, but no single device can be identified as the earliest computer, partly because of the inconsistent application of that term. A few devices are worth mentioning though, like some mechanical aids to computing, which were very successful and survived for centuries until the advent of the electronic calculator, like the Sumerian abacus, designed around 2500 BC of which a descendant won a speed competition against a modern desk calculating machine in Japan in 1946,the slide rules, invented in the 1620s, which were carried on five Apollo space missions, including to the moon and arguably the astrolabe and the Antikythera mechanism, an ancient astronomical computer built by the Greeks around 80 BC. The Greek mathematician Hero of Alexandria (c. 10–70 AD) built a mechanical theater which performed a play lasting 10 minutes and was operated by a complex system of ropes and drums that might be considered to be a means of deciding which parts of the mechanism performed which actions and when. This is the essence of programmability. Around the end of the 10th century, the French monk Gerbert d’Aurillac brought back from Spain the drawings of a machine invented by the Moors that answered either Yes or No to the questions it was asked. Again in the 13th century, the monks Albertus Magnus andRoger Bacon built talking androids without any further development (Albertus Magnus complained that he had wasted forty years of his life when Thomas Aquinas, terrified by his machine, destroyed it). In 1642, the Renaissance saw the invention of the mechanical calculator, a device that could perform all four arithmetic operations without relying on human intelligence. The mechanical calculator was at the root of the development of computers in two separate ways. Initially, it was in trying to develop more powerful and more flexible calculators that the computer was first theorized byCharles Babbage and then developed. Secondly, development of a low-cost electronic calculator, successor to the mechanical calculator, resulted in the development by Intel of the first commercially available microprocessor integrated circuit. 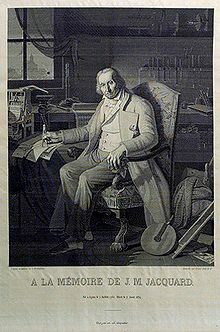 In 1801, Joseph Marie Jacquard made an improvement to the textile loom by introducing a series of punched paper cards as a template which allowed his loom to weave intricate patterns automatically. The resulting Jacquard loom was an important step in the development of computers because the use of punched cards to define woven patterns can be viewed as an early, albeit limited, form of programmability. The Zuse Z3, 1941, considered the world’s first working programmable, fully automatic computing machine. It was the fusion of automatic calculation with programmability that produced the first recognizable computers. In 1837, Charles Babbage was the first to conceptualize and design a fully programmable mechanical computer, his analytical engine. Limited finances and Babbage’s inability to resist tinkering with the design meant that the device was never completed—nevertheless his son, Henry Babbage, completed a simplified version of the analytical engine’s computing unit (the mill) in 1888. He gave a successful demonstration of its use in computing tables in 1906. This machine was given to the Science museum in South Kensington in 1910. In the late 1880s, Herman Hollerith invented the recording of data on a machine-readable medium. Earlier uses of machine-readable media had been for control, not data. “After some initial trials with paper tape, he settled on punched cards …” To process these punched cards he invented the tabulator, and the keypunch machines. These three inventions were the foundation of the modern information processing industry. Large-scale automated data processing of punched cards was performed for the 1890 United States Census by Hollerith’s company, which later became the core of IBM. By the end of the 19th century a number of ideas and technologies, that would later prove useful in the realization of practical computers, had begun to appear: Boolean algebra, the vacuum tube (thermionic valve), punched cards and tape, and the teleprinter. Alan Turing is widely regarded as the father of modern computer science. In 1936 Turing provided an influential formalisation of the concept of the algorithm and computation with the Turing machine, providing a blueprint for the electronic digital computer. Of his role in the creation of the modern computer, Time magazine in naming Turing one of the 100 most influential people of the 20th century, states: “The fact remains that everyone who taps at a keyboard, opening a spreadsheet or a word-processing program, is working on an incarnation of a Turing machine”. The ENIAC, which became operational in 1946, is considered to be the first general-purpose electronic computer. EDSAC was one of the first computers to implement the stored-program (von Neumann) architecture. The Atanasoff–Berry Computer (ABC) was the world’s first electronic digital computer, albeit not programmable. Atanasoff is considered to be one of the fathers of the computer.Conceived in 1937 by Iowa State College physics professor John Atanasoff, and built with the assistance of graduate student Clifford Berry, the machine was not programmable, being designed only to solve systems of linear equations. The computer did employ parallel computation. A 1973 court ruling in a patent dispute found that the patent for the 1946ENIAC computer derived from the Atanasoff–Berry Computer. The first program-controlled computer was invented by Konrad Zuse, who built the Z3, an electromechanical computing machine, in 1941. The first programmable electronic computer was the Colossus, built in 1943 by Tommy Flowers. George Stibitz is internationally recognized as a father of the modern digital computer. While working at Bell Labs in November 1937, Stibitz invented and built a relay-based calculator he dubbed the “Model K” (for “kitchen table”, on which he had assembled it), which was the first to use binary circuits to perform an arithmetic operation. Later models added greater sophistication including complex arithmetic and programmability. Konrad Zuse‘s electromechanical “Z machines”. The Z3 (1941) was the first working machine featuring binary arithmetic, including floating point arithmetic and a measure of programmability. In 1998 the Z3 was proved to be Turing complete, therefore being the world’s first operational computer. The non-programmable Atanasoff–Berry Computer (commenced in 1937, completed in 1941) which used vacuum tube based computation, binary numbers, and regenerative capacitor memory. The use of regenerative memory allowed it to be much more compact than its peers (being approximately the size of a large desk or workbench), since intermediate results could be stored and then fed back into the same set of computation elements. The secret British Colossus computers (1943), which had limited programmability but demonstrated that a device using thousands of tubes could be reasonably reliable and electronically reprogrammable. It was used for breaking German wartime codes. The Harvard Mark I (1944), a large-scale electromechanical computer with limited programmability. 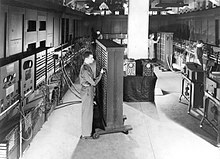 The U.S. Army’s Ballistic Research Laboratory ENIAC (1946), which used decimal arithmetic and is sometimes called the first general purpose electronic computer (since Konrad Zuse‘s Z3 of 1941 used electromagnets instead of electronics). Initially, however, ENIAC had an inflexible architecture which essentially required rewiring to change its programming. Several developers of ENIAC, recognizing its flaws, came up with a far more flexible and elegant design, which came to be known as the “stored-program architecture” or von Neumann architecture. This design was first formally described by John von Neumann in the paper First Draft of a Report on the EDVAC, distributed in 1945. A number of projects to develop computers based on the stored-program architecture commenced around this time, the first of which was completed in 1948 at the University of Manchester in England, the Manchester Small-Scale Experimental Machine (SSEM or “Baby”). The Electronic Delay Storage Automatic Calculator (EDSAC), completed a year after the SSEM at Cambridge University, was the first practical, non-experimental implementation of the stored-program design and was put to use immediately for research work at the university. Shortly thereafter, the machine originally described by von Neumann’s paper—EDVAC—was completed but did not see full-time use for an additional two years. Nearly all modern computers implement some form of the stored-program architecture, making it the single trait by which the word “computer” is now defined. While the technologies used in computers have changed dramatically since the first electronic, general-purpose computers of the 1940s, most still use the von Neumann architecture. Die of an Intel 80486DX2 microprocessor(actual size: 12×6.75 mm) in its packaging. Beginning in the 1950s, Soviet scientists Sergei Sobolev and Nikolay Brusentsov conducted research on ternary computers, devices that operated on a base three numbering system of −1, 0, and 1 rather than the conventional binary numbering system upon which most computers are based. 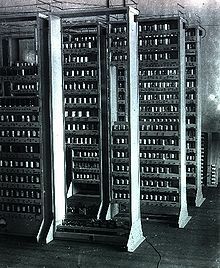 They designed the Setun, a functional ternary computer, at Moscow State University. The device was put into limited production in the Soviet Union, but supplanted by the more common binary architecture. Computers using vacuum tubes as their electronic elements were in use throughout the 1950s, but by the 1960s had been largely replaced by semiconductor transistor-based machines, which were smaller, faster, cheaper to produce, required less power, and were more reliable. The first transistorised computer was demonstrated at the University of Manchester in 1953. In the 1970s, integrated circuit technology and the subsequent creation of microprocessors, such as the Intel 4004, further decreased size and cost and further increased speed and reliability of computers. By the late 1970s, many products such as video recorders contained dedicated computers called microcontrollers, and they started to appear as a replacement to mechanical controls in domestic appliances such as washing machines. The 1980s witnessedhome computers and the now ubiquitous personal computer. With the evolution of the Internet, personal computers are becoming as common as the television and the telephone in the household. Modern smartphones are fully programmable computers in their own right, and as of 2009 may well be the most common form of such computers in existence. The defining feature of modern computers which distinguishes them from all other machines is that they can be programmed. That is to say that some type of instructions (the program) can be given to the computer, and it will process them. While some computers may have strange concepts “instructions” and “output” (see quantum computing), modern computers based on the von Neumann architecture often have machine code in the form of an imperative programming language. In practical terms, a computer program may be just a few instructions or extend to many millions of instructions, as do the programs for word processors and web browsers for example. A typical modern computer can execute billions of instructions per second (gigaflops) and rarely makes a mistake over many years of operation. Large computer programs consisting of several million instructions may take teams of programmers years to write, and due to the complexity of the task almost certainly contain errors. This section applies to most common RAM machine-based computers. In most cases, computer instructions are simple: add one number to another, move some data from one location to another, send a message to some external device, etc. These instructions are read from the computer’s memory and are generally carried out (executed) in the order they were given. However, there are usually specialized instructions to tell the computer to jump ahead or backwards to some other place in the program and to carry on executing from there. These are called “jump” instructions (or branches). Furthermore, jump instructions may be made to happen conditionally so that different sequences of instructions may be used depending on the result of some previous calculation or some external event. Many computers directly support subroutines by providing a type of jump that “remembers” the location it jumped from and another instruction to return to the instruction following that jump instruction. Program execution might be likened to reading a book. While a person will normally read each word and line in sequence, they may at times jump back to an earlier place in the text or skip sections that are not of interest. Similarly, a computer may sometimes go back and repeat the instructions in some section of the program over and over again until some internal condition is met. This is called theflow of control within the program and it is what allows the computer to perform tasks repeatedly without human intervention. Errors in computer programs are called “bugs“. They may be benign and not affect the usefulness of the program, or have only subtle effects. But in some cases they may cause the program or the entire system to “hang” – become unresponsive to input such as mouseclicks or keystrokes – to completely fail, or to crash. Otherwise benign bugs may sometimes be harnessed for malicious intent by an unscrupulous user writing an exploit, code designed to take advantage of a bug and disrupt a computer’s proper execution. Bugs are usually not the fault of the computer. Since computers merely execute the instructions they are given, bugs are nearly always the result of programmer error or an oversight made in the program’s design. Rear Admiral Grace Hopper is credited for having first used the term “bugs” in computing after a dead moth was found shorting a relay in the Harvard Mark II computer in September 1947. In most computers, individual instructions are stored as machine code with each instruction being given a unique number (its operation code or opcode for short). The command to add two numbers together would have one opcode, the command to multiply them would have a different opcode and so on. The simplest computers are able to perform any of a handful of different instructions; the more complex computers have several hundred to choose from, each with a unique numerical code. Since the computer’s memory is able to store numbers, it can also store the instruction codes. This leads to the important fact that entire programs (which are just lists of these instructions) can be represented as lists of numbers and can themselves be manipulated inside the computer in the same way as numeric data. The fundamental concept of storing programs in the computer’s memory alongside the data they operate on is the crux of the von Neumann, or stored program, architecture. In some cases, a computer might store some or all of its program in memory that is kept separate from the data it operates on. This is called the Harvard architecture after the Harvard Mark I computer. Modern von Neumann computers display some traits of the Harvard architecture in their designs, such as in CPU caches. While it is possible to write computer programs as long lists of numbers (machine language) and while this technique was used with many early computers, it is extremely tedious and potentially error-prone to do so in practice, especially for complicated programs. Instead, each basic instruction can be given a short name that is indicative of its function and easy to remember – a mnemonic such as ADD, SUB, MULT or JUMP. These mnemonics are collectively known as a computer’s assembly language. Converting programs written in assembly language into something the computer can actually understand (machine language) is usually done by a computer program called an assembler. A 1970s punched card containing one line from aFORTRAN program. The card reads: “Z(1) = Y + W(1)” and is labelled “PROJ039” for identification purposes. Programming languages provide various ways of specifying programs for computers to run. Unlike natural languages, programming languages are designed to permit no ambiguity and to be concise. They are purely written languages and are often difficult to read aloud. They are generally either translated into machine code by a compiler or an assembler before being run, or translated directly at run time by an interpreter. Sometimes programs are executed by a hybrid method of the two techniques. Machine languages and the assembly languages that represent them (collectively termed low-level programming languages) tend to be unique to a particular type of computer. For instance, an ARM architecture computer (such as may be found in a PDA or a hand-held videogame) cannot understand the machine language of an Intel Pentium or the AMD Athlon 64 computer that might be in a PC. Though considerably easier than in machine language, writing long programs in assembly language is often difficult and is also error prone. Therefore, most practical programs are written in more abstract high-level programming languages that are able to express the needs of the programmer more conveniently (and thereby help reduce programmer error). High level languages are usually “compiled” into machine language (or sometimes into assembly language and then into machine language) using another computer program called a compiler. High level languages are less related to the workings of the target computer than assembly language, and more related to the language and structure of the problem(s) to be solved by the final program. It is therefore often possible to use different compilers to translate the same high level language program into the machine language of many different types of computer. This is part of the means by which software like video games may be made available for different computer architectures such as personal computers and various video game consoles. Program design of small programs is relatively simple and involves the analysis of the problem, collection of inputs, using the programming constructs within languages, devising or using established procedures and algorithms, providing data for output devices and solutions to the problem as applicable. As problems become larger and more complex, features such as subprograms, modules, formal documentation, and new paradigms such as object-oriented programming are encountered. Large programs involving thousands of line of code and more require formal software methodologies. The task of developing large software systems presents a significant intellectual challenge. Producing software with an acceptably high reliability within a predictable schedule and budget has historically been difficult; the academic and professional discipline of software engineering concentrates specifically on this challenge. A general purpose computer has four main components: the arithmetic logic unit (ALU), the control unit, the memory, and the input and output devices (collectively termed I/O). These parts are interconnected by busses, often made of groups of wires. Inside each of these parts are thousands to trillions of small electrical circuits which can be turned off or on by means of an electronic switch. Each circuit represents a bit (binary digit) of information so that when the circuit is on it represents a “1”, and when off it represents a “0” (in positive logic representation). The circuits are arranged in logic gates so that one or more of the circuits may control the state of one or more of the other circuits. Diagram showing how a particular MIPS architecture instruction would be decoded by the control system. The control unit (often called a control system or central controller) manages the computer’s various components; it reads and interprets (decodes) the program instructions, transforming them into a series of control signals which activate other parts of the computer. Control systems in advanced computers may change the order of some instructions so as to improve performance. Read the code for the next instruction from the cell indicated by the program counter. Decode the numerical code for the instruction into a set of commands or signals for each of the other systems. Increment the program counter so it points to the next instruction. Read whatever data the instruction requires from cells in memory (or perhaps from an input device). The location of this required data is typically stored within the instruction code. Provide the necessary data to an ALU or register. If the instruction requires an ALU or specialized hardware to complete, instruct the hardware to perform the requested operation. Write the result from the ALU back to a memory location or to a register or perhaps an output device. Jump back to step (1). Since the program counter is (conceptually) just another set of memory cells, it can be changed by calculations done in the ALU. Adding 100 to the program counter would cause the next instruction to be read from a place 100 locations further down the program. Instructions that modify the program counter are often known as “jumps” and allow for loops (instructions that are repeated by the computer) and often conditional instruction execution (both examples of control flow). The sequence of operations that the control unit goes through to process an instruction is in itself like a short computer program, and indeed, in some more complex CPU designs, there is another yet smaller computer called a microsequencer, which runs a microcodeprogram that causes all of these events to happen.